Implementing community based early warning in Sri Lanka in collaboration with regional partners, SEI is undertaking a participatory assessment of the enabling conditions for implementing community based early warning in the Indian Ocean. 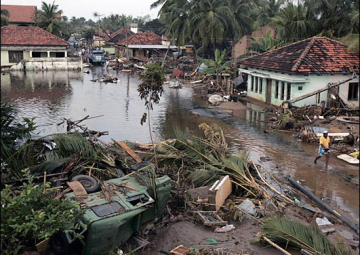 As part of the Sida funded programme Sustainable Recovery and Resilience Building in the Tsunami Affected Region, Frank Thomalla and Rasmus Klocker Larsen recently conducted field visits to Sri Lanka. The visits were facilitated by the Asian Disaster Preparedness Centre (ADPC). Whilst the technological aspects of the IOEWS have received considerable attention by donors and governments, addressing community preparedness and disaster management activities in EWS development does not often receive the same attention or resources. Despite sufficient generic and case specific knowledge on the importance of addressing the last mile in EWS, organisations and agencies at regional, national and sub-national levels face considerable challenges in applying these insights and implementing guidance and policy recommendations. The multi-stakeholder participatory assessment of last mile implementation conducted by SEI aims to add value to existing efforts by providing a platform for stakeholders involved in the Indian Ocean Early Warning System, and other regional efforts to develop Early Warning systems, to create an improved understanding of the enabling conditions needed for different actors to implement recommendations and guidance under the constraints of their daily work such as limited financial and human capacity, conflicting demands by donors and end users, and divergence in organisational agendas of different stakeholders. The assessment is being conducted through an analysis of the post-tsunami literature on EWS; an online dialogue via email correspondence and e-forum; consultations with key informants in different government departments and at different administrative levels; international and national non-governmental and humanitarian organisations, and community-based organisations (CBOs); and focus group discussions in communities at risk from coastal hazards. This methodology allows exploration of different interpretations of last mile implementation challenges, reflection on challenges and opportunities, and institutional learning.